For over 47 years AMG has been home to some of the fastest, most exciting and often flamboyant road and racing cars to wear the famous Mercedes-Benz three-pointed star. The path to road car production has been untraditional, we examine how these once-fabled German tuners moved from building racing engines in their spare time at home to developing fully-fledged car production cars 43 years later. AMG was founded by two motorsport enthusiasts, Hans-Werner Aufrecht and Erhard Melcher. 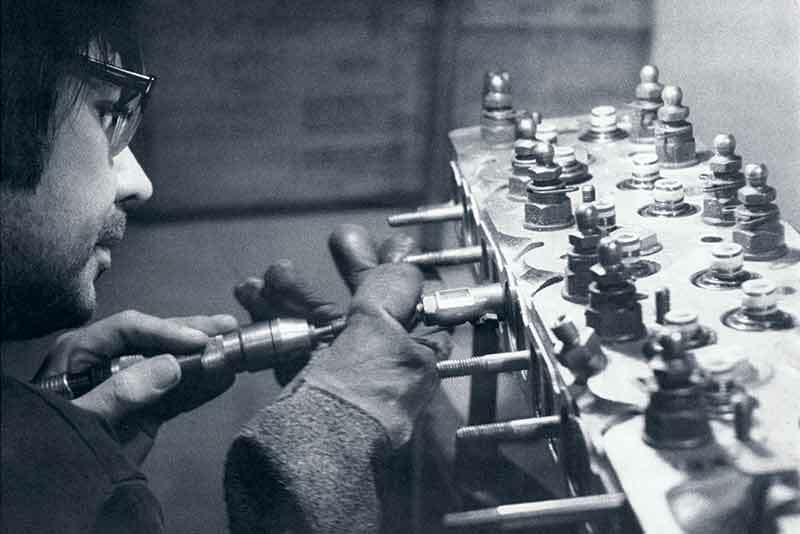 In 1965 Hans-Werner Aufrecht was working as a dynamometer engineer testing the 300 SE racing engines for Mercedes-Benz. While working on production engines, he met Erhard Melcher, a fellow engineer, who had just finished college. They shared a passion for motorsport and started servicing several 300 SE belonging to local racing drivers in their spare time. From Aufrecht’s home in Grossaspach, they modified the 300SE engines, fitting them with direct fuel injection. The results spoke for themselves and word quickly spread, earning them a reputation in racing circles. In early 1967, Aufrecht and Melcher handed in their notice and rented a workshop in a barn in the Swabian town of Burgstall. They named their new operation ‘AMG’. The initials stand for Aufrecht, Melcher and Grossaspach, Grossaspach being Aufrecht’s birthplace. 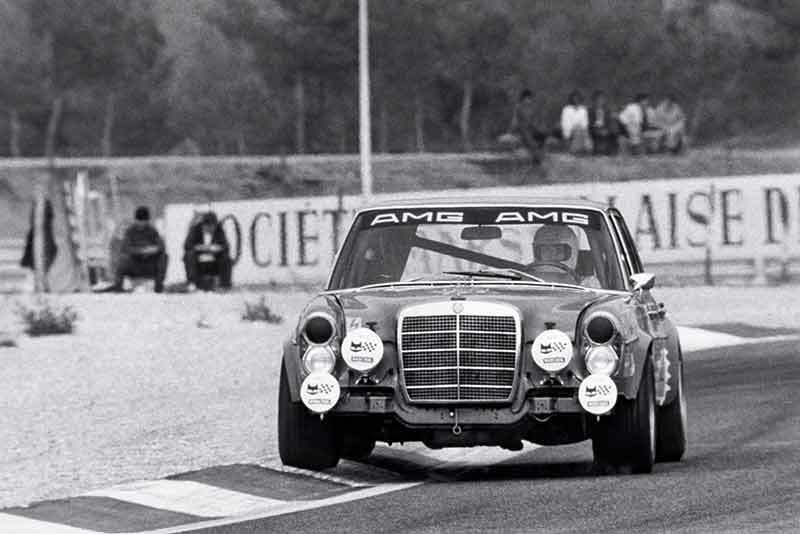 AMG’s first big success came at the 24 hours of Spa in 1971. A 300 SEL 6.8 AMG, nicknamed the ‘Red Pig’, finished first in class and second overall, causing a little consternation among the motorsport establishment but a great deal of respect among a field made up of much smaller cars. By 1976, the company’s success in engine building and motorsports, meant they had outgrown the Burgstall headquarters and so they re-located to Affalterbach. The extra space allowed them to fulfil another dream and start developing bespoke, high-performance Mercedes-Benz road cars. 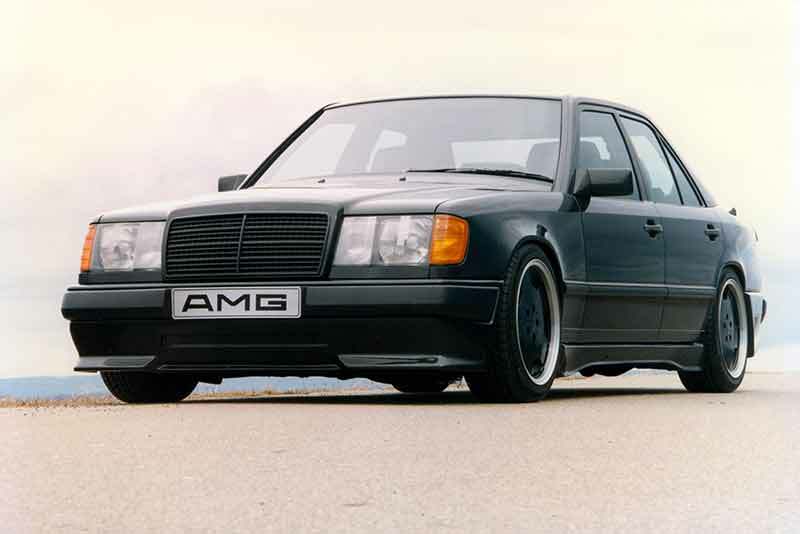 The car that really put AMG into the motoring enthusiast lexicon was ‘The Hammer’, released in 1986. A humble 300E saloon equipped with a 385 bhp, 5.6-litre V8. The Hammer accelerated to sixty mph in just 5 seconds, and didn’t let up until it reached a top speed of 190 mph. Supercar-humbling performance in the mid-eighties. In 1991 AMG and Mercedes-Benz began an official cooperation, with Affalterbach engineers now-officially working their wizardry to selected high performance Mercedes-Benz models. 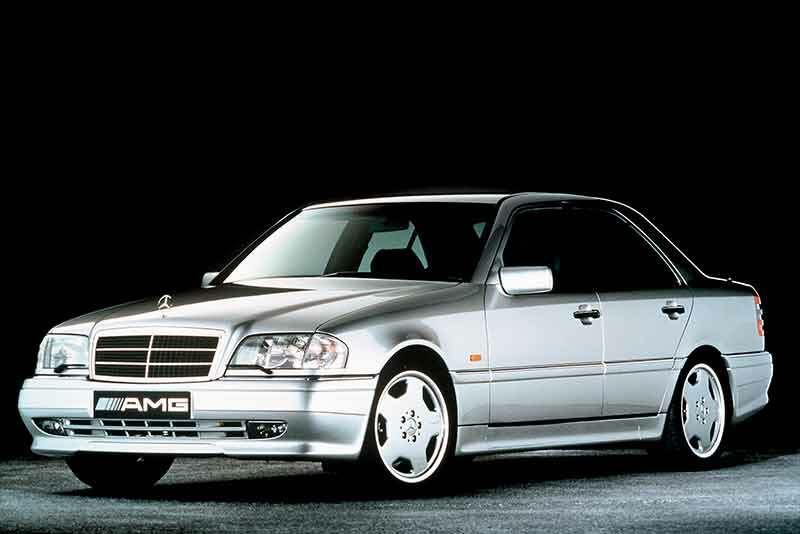 Launched In 1993, the C36 AMG was the first car jointly developed by Mercedes-Benz and AMG. With 276 bhp and 283 Ib ft of torque, the C36 may seem modest compared with modern sports saloons. Today, in an age of 500bhp+ super-saloons, the C36’s 0-60 time of 6.7 seconds might not sound that impressive but, in the early nineties 280bhp super-saloons weren’t all that common and the C36 caused quite a stir. The C36 AMG was a real ‘wolf in sheeps clothing’, loved by the press, the car proved to Mercedes-Benz top-brass that AMG could be trusted to dispense their high-performance formula to a much larger market. It is for this reason that Carphile argues the C36 is AMG’s most important car to date. Six years after the C 36 debuted, in January 1999, and as the mighty E 55 AMG was entering the market, Daimler acquired 51 per cent of shares in the company, leading to the company to be renamed Mercedes-AMG GmbH. AMG became a wholly owned subsidiary of Daimler in 2005. The first engine entirely designed and engineered by AMG arrived in 2006. Codenamed M156 and displacing 6,208 cc, the unit was one of the most powerful naturally aspirated engines of its kind and an evolved version of the engine continues to be produced today. In 2010, the SLS AMG Coupé, the first entirely AMG-engineered car was launched. The dramatic gullwing doors inspired by the classic 300SL, a naturally aspirated 6.2-litre V8 and concept car styling. The SLS AMG marked a huge step for the company and the car evolved into a Roadster and a highly successful GT3 racing car before road-going variants, the GT and Black Series were created. Production ended in early 2014. Mercedes-AMG GmbH currently employs a workforce of just over a thousand people at its plant in Affalterbach. The second sports car developed in-house by AMG, The 190mph Mercedes-AMG GT, will be released in the UK in 2015.